As one who shared the brunt of nature’s fury, I was revisiting the traumatic experiences while going through your cover story (‘Burnt by water’, September 2). The tales of innate goodness, fortitude, perseverance, stoicism and selfless service rekindled the damp and dispirited mind. While it is no easy task to obliterate the ‘water mark’ on the psyche of Malayalis any time soon, the outpouring of munificence from far and near instills hope that we shall overcome. The deluge in Kerala and Kodagu in Karnataka, owing to incessant rainfall, has thrown up many challenges. The situation in the low-lying areas of Kerala is heart-wrenching. The lack of preparedness on the part of the authorities, despite rainfall occurring from past few weeks, throws questions on how quickly we can respond to emergency—at a time when technology has outpaced humans in most aspects. Let us thank the Army, the Navy, the Air Force and other Central forces for having helped people in distress. Now, the civil aviation ministry should intensify its efforts to open up greenfield airports and expand its UDAN scheme—as that will be a big help in rescue operations. The authorities should also consider establishing an exclusive airborne rescue force for civilian evacuations during natural calamities. The fury of floods took its toll on Kerala. People all over have chatted, talked, written and debated on why it happened, how we should have dealt with it, the mistakes, the remedies, so on and so forth. But what touches one’s heart is how calamities of such enormous proportion have brought out the true nature of humans—one of love and kindness. Your interview with Madhav Gadgil should serve as an eye-opener. 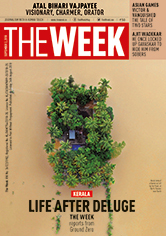 The Western Ghats Ecology Expert Panel, headed by Gadgil, warned in no uncertain terms about disasters awaiting Kerala and other southern states due to large scale destruction of forests, unabated stone quarrying, encroachment of riverbeds, unauthorised construction on hill slopes and large scale destruction to life and property. Last year, while returning from Kerala, I got the opportunity to discuss the ecological problems faced by the state with Gadgil. He told me that he was strongly opposed to the implementation of the Athirappilly Hydro Electric Project, which according to him, would further damage the ecology of the region. It is unfortunate that, despite expert advice, the authorities in Kerala are planning to go ahead with the project. Atal Bihari Vajpayee will remain one of the greatest leaders India has ever seen; he respected her diversity and wanted people from different backgrounds to live in harmony (‘Silver tongue, sharp talons’, September 2). I wanted Vajpayee to win the 2004 election and continue as prime minister, but that was not to happen. Vajpayee provided space for everyone in the party to grow. Your package on Vajpayee was interesting. I read each and every article with immense interest. Not only was Vajpayee an honest politician but also a great human being. He was revered by one and all, including his opponents in Parliament. As prime minister, he gave full attention and care to his opponents. He defended allegations against him in a very light manner, and with confidence. Jawaharlal Nehru had predicted that Vajpayee will one day become the country’s prime minister. But, his daughter, Indira, did not like Vajpayee. It is said that Vajpayee called Indira ‘Durga’ after India defeated Pakistan in the 1971 war. However, when Indira declared Emergency, Vajpayee, as well as Advani, were put behind bars in Bengaluru. Vajpayee, I gather, was a good cook and was addicted to sweets. I was fortunate to have got a chance to work with Ajit Wadekar at the State Bank of India in Baroda (‘Cerebral star’, September 2). There, he brought Mohammad Azharuddin and Sandip Patil for deposit mobilisation efforts, announcing that any single deposit receipts above $5 lakh would be countersigned by one of them, and, the ones above $10 lakh would be countersigned by Wadekar himself. He was a simple and easily approachable officer who was quick in disposing of the files, especially those relating to loans. Those days both of us used to reach the office at the same time and we walked up the stairs to the sixth floor exchanging pleasantries. As the president of the All India Cricket Association for the Physically Challenged, Wadekar encouraged visually-impaired cricketers as well as those who were differently-abled. Wadekar was known for his sense of humour, and cheered people up with his wit in difficult situations. There are many positive lessons to be learnt from Wadekar’s life, whether or not one is a cricketer. Please do not publish columns like the one by Anuja Chauhan (‘It’s not the women, silly’, September 2). It is frustrating to see such a low-standard, WhatsApp forward-based column getting published in your magazine. Hardly 0.001 per cent of your readers would have thought the way Chauhan thought. Most people have whole-heartedly supported everything she has criticised. Let your magazine unite people and not divide.